As I sit here cross-legged on my sofa with a cup of lavender earl grey tea and Jo Malone's Grapefruit candle providing the perfect ambiance, I'm reminded of one simple truth: Moments of solitude can be the most soul-stirring and magical touch points in life. I love my living room where I am writing this because it's the one place in my home where I can truly live and do all of the things that I take pleasure in - entertaining, writing, reading, watching films, even taking an occasional cat nap, exercising, dancing or enjoying nothing more than tea and Amy Winehouse on my stereo. Just a few moments ago I was engrossed in answering a reporter's email when the bell rang and I accepted a package of books I had ordered -- All 11 V&A Pattern Books that I've been dying to own arrived along with a jaw-droppingly tactile new book I mistakenly spotted (and so glad I did!) 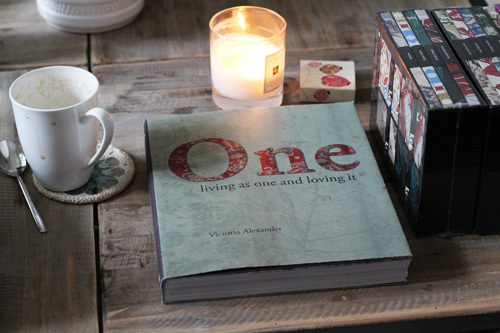 called "One" by Victoria Alexander published by Murdoch Books. One? What's that? Here is a show following by a tell. 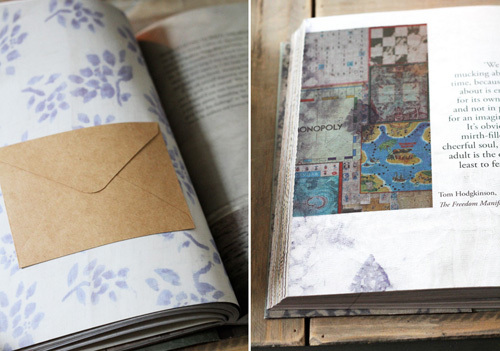 Pages with ruffled edging (oh my! ), a few lovely inserts like an envelope here, a small card there... Gorgeous matte paper with a lovely weight to it, lots of snappy travel photos, quotes throughout, layered elements of papers, maps, fabrics... It's stunning from a visual perspective and though I've just begun to read it, I am certain I'll finish this book because it's the perfect combination of self-help and visuals. I must admit, I barely read self help books, not because I don't need to (ha ha!) but because I don't like to read them. Too much text, too much blah blah. Often a writer can take an entire chapter and edit it down to two pages because we don't always need the full scoop. I'm happy to get half a scoop with photos allowing me to explore the missing half, the half that I can search and find on my own. I like books that allow me to come to my own conclusion in the end. If a book that talks about the journey of someone's life -- what they've learned, where they've been and how they approached then solved their many issues allow the way -- and combines those words with photography throughout I am absolutely going to pick it up and give it a good solid flip through. If I read a few sentences and the word "I" is used ad naseum, the book returns to the shelf but on the other hand, if it captures my heart through text and imagery from the very first page then its love at first sight and it will be on its merry little way to the cashier's desk clutched tightly to my chest. I know a gem when I spot it. One - Living As One and Loving It is such a gem. 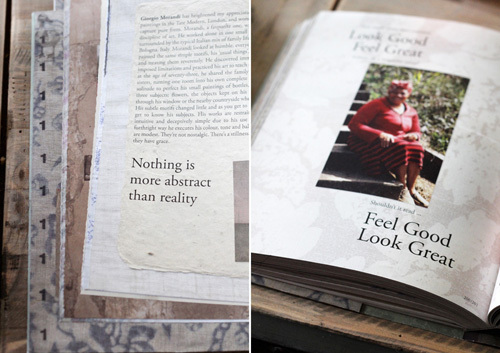 About this book the publisher says, "One is a celebration of individuality and life. Author Victoria Alexander writes with humour and wisdom about the importance of believing in and valuing ourselves. She reminds us to trust in ourselves, try things on for size, take risks and ask for what we want - after all, we might just get it. At its heart, this beautifully layered collection of stories, quotes, reflections and evocative images is about the power of choice and about enjoying life, with all its shifts and changes. Its message is universal: accept who you are and who you can be, whether you live alone, or whether you are one of many. " I can't wait to explore more about this book, to dig more deeply and to find out more about a book that is meant for everyone - from those living alone to those in relationships, as I think we all can feel very alone at times whether in a huge family or simply as a party of one in our little cottage by the sea. Do you have a copy of One? What do you think of it? Isn't it sumptuous?